Sony would like to offer a free exchange of the external battery case included in the package of “CD Walkman”, having model names of “D-NE800”, “D-EJ700”, “D-EJ800”, “D-NE1”, “D-NE9”, “D-EJ985” and “D-EJ885”. 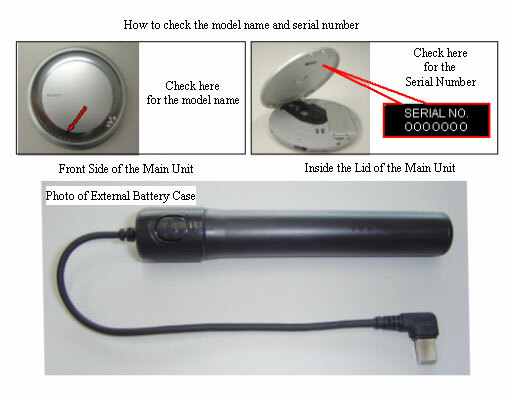 We have discovered there is a possibility that some of the external battery cases included in the package of the models mentioned above may overheat and alter in shape due to a problem with the cords of such external battery cases. To all customers who own a “CD Walkman” with the model names and serial numbers listed below, we would like to ask to contact our call center. We sincerely apologize for any inconvenience that this issue may cause. Although we have already offered a free exchange of the external battery case for these four models on November 19, 2003, we have recently discovered that the replaced battery cases still have a rare possibility of the same problem. We would like to again offer a free exchange of the battery case with a further improved battery case for all customers who own the affected CD Walkman. For customers who have already exchanged the battery case in response to the previous notice , we would like to contact you soon. If the mailing address has been changed since then, please kindly contact our call center again. We sincerely apologize for the additional inconvenience . Personal information, such as your name and mailing address, provided to the contact above will be kept and used only for the free exchange and repair service. The information may be disclosed to the third party subcontractors that operate such service on behalf of Sony, but will be strictly controlled and will not be used for any other purposes.